Diagenode’s Auto iDeal ChIP-qPCR Kit is a highly optimized automated solution for ChIP-qPCR assays. The kit is compatible for use on the IP-Star Compact Automated System. The Auto iDeal ChIP-qPCR Kit provides high yields with excellent specificity and sensitivity as well as unmatched reproducibility with true walk-away automation on the IP-Star. Use the Auto iDeal ChIP-qPCR Kit with our ChIP-grade antibodies for highest quality data. ChIP was performed on IP-Star Compact Automated System using the Auto iDeal ChIP-qPCR Kit, the antibodies (A) anti-H3K4me3 (Diagenode, Cat. no. C15410003) and (B) anti-CTCF (Diagenode, Cat. no. C15410210) . 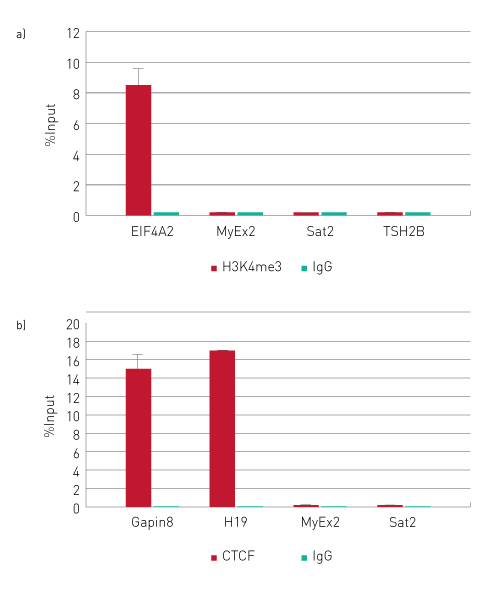 Sheared chromatin from 1 million (A) and 4 million (B) cells human HeLa cells, 1 µg of the positive control antibody and 1 µg of the negative IgG control (Diagenode, Cat. no. C15410206) were used per IP. The qPCR reactions were performed using primers for specific positive and negative loci. The figure shows the recovery expressed as a percentage of input (the relative amount of immunoprecipitated DNA compared to input DNA after qPCR analysis). Error bars represent the standard deviation of at least 2 biological repetitions . Diagenode strongly recommends using this:	Auto iDeal ChIP-qPCR Kit (Diagenode Cat# C01010181). Click here to copy to clipboard. Please, determine the serial number of your instrument in your comment.